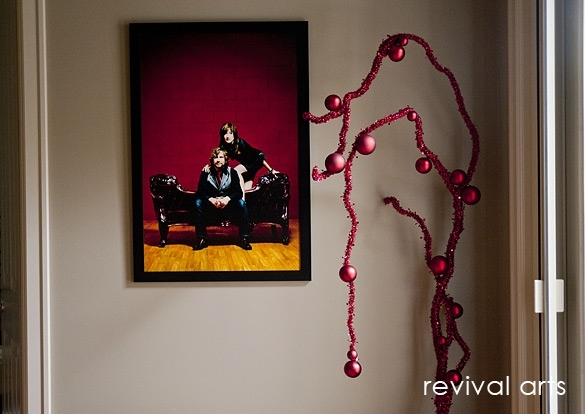 Darcie Brown of Revival Arts partners with her husband, Jason, to provide innovative, artsy portraiture and beautiful home décor displays. They capture life from an original perspective and enjoy creating art that their clients will enjoy for many years. Jason and Darcie Brown have photographed both Laurel’s and my family over the years. 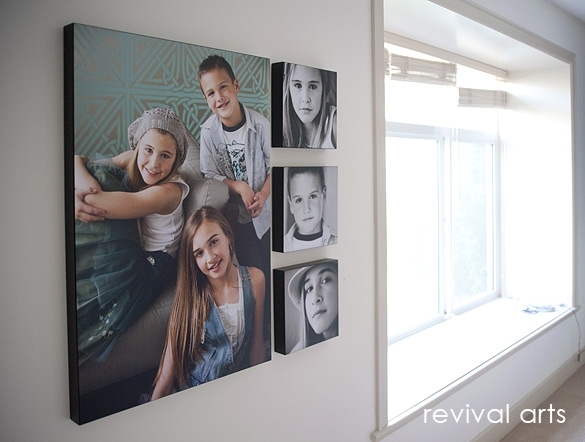 We’ve fallen in love with the pics that they taken of our kids and recently we asked Darcie how to best use these portraits as art in our homes. There’s something about surrounding yourself with photographs of the people you love the most that changes a house into a home. I know some days, walking by a portrait of our family is the nudge I need to refocus and regain perspective on what’s important in my life. Also, when children are surrounded by photographs of their family, they feel a sense of stability and develop a stronger sense of self. How do I choose photographs for my walls? Trust your instincts. Follow your heart. Sometimes the best photographs we take are when people aren’t expecting to be captured. Other times, the portrait that speaks to our clients are the perfectly posed and planned out ones. You don’t have to over analyze the choice. Just look for something that has an emotional connection for you and trust the advice of your photographer. My walls are blank. Where should I start? 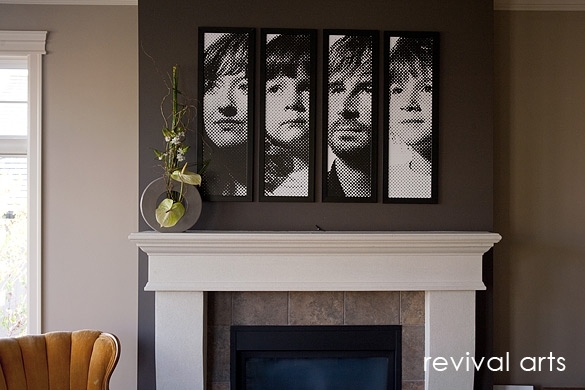 Walk around your home and decide where you could display portraits. Common areas are over the mantle, behind a couch, in an entrance and down a hall. Think of what the sight lines are from key areas that you spend time. What is the first thing you see when you walk in your home? 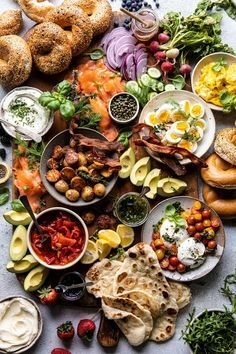 What can you see from your table? It should be something you love. I am someone who thinks bigger is better when it comes to displaying portraits. It’s always disappointing when a photograph is too small and is underwhelming when displayed. A general rule of thumb is that you want an art piece to take up two-thirds to three-quarters of the space it’s in. What if I want to hang a group of photographs? Hanging a collection of images to tell a visual story is quite popular. 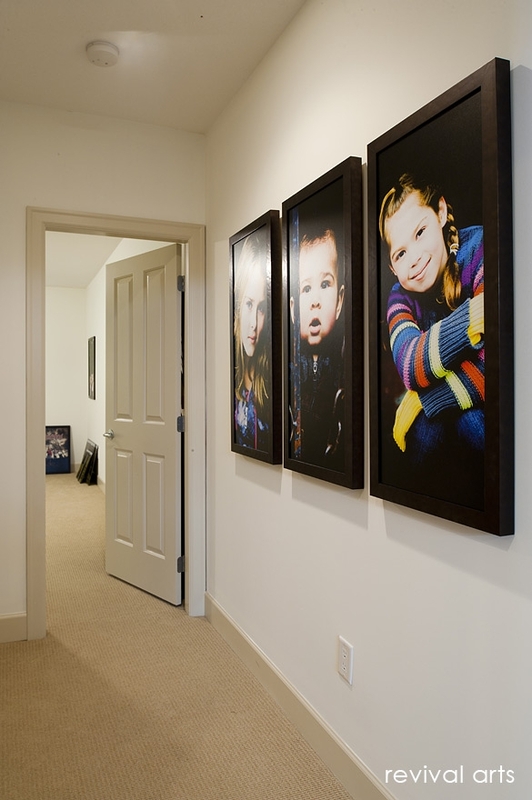 Images hung in a cluster are often smaller which means you need to choose a location that people can walk up to the photographs and spend time taking them in. Halls are great for this. A collection over a bed is not as effective. Have a center of interest – Choose some larger images to draw the viewers eye and allow it to rest before taking in the rest of the smaller photographs. Plan your layout – Start with the center images and work your way out to the edges. Keep the frames an equal distance apart. I personally enjoy a simple portrait display with fewer images. Less is more. Our montages don’t have more than five photographs. I recognize these precious kids...Laurel, your kids look stunning! 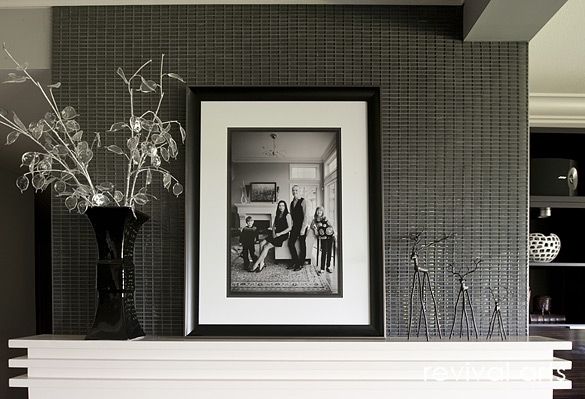 Is there anything else to consider when displaying photographs? Portraits are generally hung at eye level. 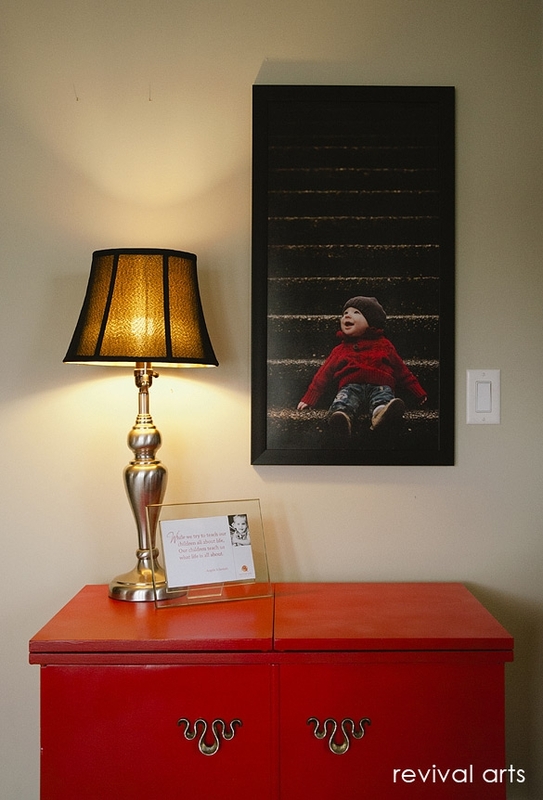 Use your common sense when hanging them as different spaces may look better with the art at a non-standard height. The main thing is to have fun and try something new! 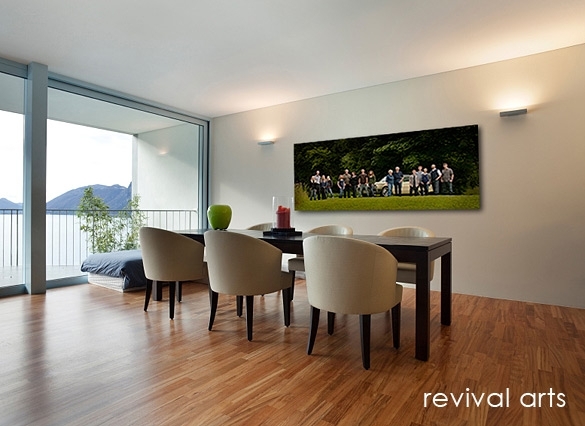 By using photographs of the people you love, you can take the art in your home to a new level.